© Copyright 2004-2011 Apple Computer, Inc., Mozilla Foundation, and Opera Software ASA. You are granted a license to use, reproduce and create derivative works of this document. © 2011-2013 W3C® (MIT, ERCIM, Keio, Beihang), All Rights Reserved. Document use rules apply. For the entire publication on the W3C site the liability and trademark rules apply. Privacy issues that arise when exposing local capabilities and local streams. Technical discussions within the task force. Experience gained through early experimentations. Feedback received from other groups and individuals. This document was published by the Web Real-Time Communication Working Group and Device APIs Working Group as an Editor's Draft. If you wish to make comments regarding this document, please send them to public-media-capture@w3.org (subscribe, archives). All comments are welcome. This document was produced by a group operating under the 5 February 2004 W3C Patent Policy. W3C maintains a public list of any patent disclosures (Web Real-Time Communication Working Group, Device APIs Working Group) made in connection with the deliverables of the group; that page also includes instructions for disclosing a patent. An individual who has actual knowledge of a patent which the individual believes contains Essential Claim(s) must disclose the information in accordance with section 6 of the W3C Patent Policy. Access to multimedia streams (video, audio, or both) from local devices (video cameras, microphones, Web cams) can have a number of uses, such as real-time communication, recording, and surveillance. Implementations that use ECMAScript to implement the APIs defined in this specification must implement them in a manner consistent with the ECMAScript Bindings defined in the Web IDL specification [ WEBIDL ], as this specification uses that specification and terminology. The EventHandler interface represents a callback used for event handlers as defined in [ HTML5 ]. The concepts queue a task and fires a simple event are defined in [ HTML5 ]. The terms event handlers and event handler event types are defined in [ HTML5 ]. A source is the "thing" providing the source of a media stream track. The source is the broadcaster of the media itself. A source can be a physical webcam, microphone, local video or audio file from the user's hard drive, network resource, or static image. Some sources have an identifier which must be unique to the application (un-guessable by another application) and persistent between application sessions (e.g., the identifier for a given source device/application must stay the same, but not be guessable by another application). Sources that must have an identifier are camera and microphone sources; local file sources are not required to have an identifier. Source identifiers let the application save, identify the availability of, and directly request specific sources. Other than the identifier, other bits of source identity are never directly available to the application until the user agent connects a source to a track. Once a source has been "released" to the application (either via a permissions UI, pre-configured allow-list, or some other release mechanism) the application will be able discover additional source-specific capabilities. Sources do not have constraints -- tracks have constraints. When a source is connected to a track, it must conform to the constraints present on that track (or set of tracks). Sources will be released (un-attached) from a track when the track is ended for any reason. On the MediaStreamTrack object, sources are represented by a sourceType attribute. The behavior of APIs associated with the source's capabilities and state change depending on the source type. Sources have capabilities and state. The capabilities and state are "owned" by the source and are common to any (multiple) tracks that happen to be using the same source (e.g., if two different tracks objects bound to the same source ask for the same capability or state information, they will get back the same answer). State refers to the immediate, current value of the source's (optionally constrained) capabilities. State is always read-only. A source's state can change dynamically over time due to environmental conditions, sink configurations, or constraint changes. A source's state must always conform to the current set of mandatory constraints that all of the tracks it is bound to have defined, and should do its best to conform to the set of optional constraints specified. A source's state is directly exposed to audio and video track objects through individual read-only attributes. These attributes share the same name as their corresponding capabilities and constraints. Events are available that signal to the application that source state has changed. A conforming user-agent must support all the state names defined in this spec. Source capabilities are the intrinsic "features" of a source object. For each source state, there is a corresponding capability that describes whether it is supported by the source and if so, what the range of supported values are. Capabilities are expressed as either a series of states (for enumerated-type capabilities) or as a min/max range. The values of the supported capabilities must be normalized to the ranges and enumerated types defined in this specification. Capabilities return the same underlying per-source capabilities, regardless of any user-supplied constraints present on the source (capabilities are independent of constraints). Source capabilities are effectively constant. Applications should be able to depend on a specific source having the same capabilities for any session. Constraints are an optional feature for restricting the range of allowed variability on a source. Without provided constraints, implementations are free to select a source's state from the full range of its supported capabilities, and to adjust that state at any time for any reason. Constraints may be optional or mandatory. Optional constraints are represented by an ordered list, mandatory constraints are an unordered set. The order of the optional constraints is from most important (at the head of the list) to least important (at the tail of the list). Constraints are stored on the track object, not the source. Each track can be optionally initialized with constraints, or constraints can be added afterward through the constraint APIs defined in this spec. Applying track level constraints to a source is conditional based on the type of source. For example, read-only sources will ignore any specified constraints on the track. It is possible for two tracks that share a unique source to apply contradictory constraints. Under such contradictions, the implementation will mute both tracks and notify them that they are over-constrained. Events are available that allow the application to know when constraints cannot be met by the user agent. These typically occur when the application applies constraints beyond the capability of a source, contradictory constraints, or in some cases when a source cannot sustain itself in over-constrained scenarios (overheating, etc.). Constraints that are intended for video sources will be ignored by audio sources and vice-versa. Similarly, constraints that are not recognized will be preserved in the constraint structure, but ignored by the application. This will allow future constraints to be defined in a backward compatible manner. A correspondingly-named constraint exists for each corresponding source state name and capability name. In general, user agents will have more flexibility to optimize the media streaming experience the fewer constraints are applied. The MediaStream interface is used to represent streams of media data, typically (but not necessarily) of audio and/or video content, e.g. from a local camera. The data from a MediaStream object does not necessarily have a canonical binary form; for example, it could just be "the video currently coming from the user's video camera". This allows user agents to manipulate media streams in whatever fashion is most suitable on the user's platform. Each MediaStream object can contain zero or more tracks, in particular audio and video tracks. All tracks in a MediaStream are intended to be synchronized when rendered. Different MediaStreams do not need to be synchronized. Each track in a MediaStream object has a corresponding MediaStreamTrack object. A MediaStreamTrack represents content comprising one or more channels, where the channels have a defined well known relationship to each other (such as a stereo or 5.1 audio signal). A channel is the smallest unit considered in this API specification. A MediaStream object has an input and an output. The input depends on how the object was created: a MediaStream object generated by a getUserMedia() call (which is described later in this document), for instance, might take its input from the user's local camera. The output of the object controls how the object is used, e.g., what is saved if the object is written to a file or what is displayed if the object is used in a video element. Each track in a MediaStream object can be disabled, meaning that it is muted in the object's output. All tracks are initially enabled. A MediaStream can be finished, indicating that its inputs have forever stopped providing data. The output of a MediaStream object MUST correspond to the tracks in its input. Muted audio tracks MUST be replaced with silence. Muted video tracks MUST be replaced with blackness. A new MediaStream object can be created from accessible media sources (that does not require any additional permissions) using the MediaStream() constructor. The constructor argument can either be an existing MediaStream object, in which case all the tracks of the given stream are added to the new MediaStream object, or an array of MediaStreamTrack objects. The latter from makes it possible to compose a stream from different source streams. Both MediaStream and MediaStreamTrack objects can be cloned. This allows for greater control since the separate instances can be manipulated and consumed individually. A cloned MediaStream contains clones of all member tracks from the original stream. When a MediaStream object is being generated from a local file (as opposed to a live audio/video source), the user agent SHOULD stream the data from the file in real time, not all at once. The MediaStream object is also used in contexts outside getUserMedia, such as [ WEBRTC10 ]. In both cases, ensuring a realtime stream reduces the ease with which pages can distinguish live video from pre-recorded video, which can help protect the user's privacy. Let stream be a newly constructed MediaStream object. Initialize stream's id attribute to a newly generated value. If the constructor's argument is present, run the sub steps that corresponds to the argument type. Add track: Let track be the MediaStreamTrack about to be processed. If track has ended or if there is already a MediaStreamTrack contained within stream that has the same underlying source as track, then abort these steps and continue with the next track (if any). Add track to stream's track set. Run the sub steps labeled Add track (above) for every MediaStreamTrack in the argument stream's track set. A MediaStream can have multiple audio and video sources (e.g. because the user has multiple microphones, or because the real source of the stream is a media resource with many media tracks). The stream represented by a MediaStream thus has zero or more tracks. The tracks of a MediaStream are stored in a track set. The track set MUST contain the MediaStreamTrack objects that correspond to the tracks of the stream. The relative order of the tracks in the set is user agent defined and the API will never put any requirements on the order. The proper way to find a specific MediaStreamTrack object in the set is to look it up by its id. An object that reads data from the output of a MediaStream is referred to as a MediaStream consumer. The list of MediaStream consumers currently includes the media elements and the PeerConnection API specified in [ WEBRTC10 ]. MediaStream consumers must be able to handle tracks being added and removed. This behavior is specified per consumer. Set the object's ended attribute to true. Fire a simple event named ended at the object. If the end of the stream was reached due to a user request, the task source for this task is the user interaction task source. Otherwise the task source for this task is the networking task source. Throughout this specification, the identifier MediaStreamTrackSequence is used to refer to the sequence<MediaStreamTrack> type. The MediaStream.ended attribute MUST return true if the MediaStream has finished, and false otherwise. When a MediaStream object is created, its ended attribute MUST be set to false, unless it is being created using the MediaStream() constructor whose arguments are lists of MediaStreamTrack objects that are all ended, in which case the MediaStream object MUST be created with its ended attribute set to true. When a MediaStream object is created, the user agent MUST generate a globally unique identifier string, and MUST initialize the object's id attribute to that string. Such strings MUST only use characters in the ranges U+0021, U+0023 to U+0027, U+002A to U+002B, U+002D to U+002E, U+0030 to U+0039, U+0041 to U+005A, U+005E to U+007E, and MUST be 36 characters long. The id attribute MUST return the value to which it was initialized when the object was created. This event handler, of type addtrack, MUST be supported by all objects implementing the MediaStream interface. This event handler, of type ended, MUST be supported by all objects implementing the MediaStream interface. This event handler, of type removetrack, MUST be supported by all objects implementing the MediaStream interface. Adds the given MediaStreamTrack to this MediaStream. Let track be the MediaStreamTrack argument and stream this MediaStream object. If stream is finished, throw an INVALID_STATE_ERR exception. If track is already in stream's track set, then abort these steps. Clones the given MediaStream and all its tracks. Let streamClone be a newly constructed MediaStream object. Initialize streamClone's id attribute to a newly generated value. Let trackSetClone be a list that contains the result of running MediaStreamTrack.clone() on all the tracks in this stream. Let trackSetClone be streamClone's track set. Returns a sequence of MediaStreamTrack objects representing the audio tracks in this stream. The getAudioTracks() method MUST return a sequence that represents a snapshot of all the MediaStreamTrack objects in this stream's track set whose kind is equal to "audio". The conversion from the track set to the sequence is user agent defined and the order does not have to stable between calls. The getTrackById() method MUST return the first MediaStreamTrack object in this stream's track set whose id is equal to trackId. The method MUST return null if no track matches the trackId argument. Returns a sequence of MediaStreamTrack objects representing the video tracks in this stream. The getVideoTracks() method MUST return a sequence that represents a snapshot of all the MediaStreamTrack objects in this stream's track set whose kind is equal to "video". The conversion from the track set to the sequence is user agent defined and the order does not have to stable between calls. Removes the given MediaStreamTrack from this MediaStream. If track is in stream's track set, remove it. A MediaStreamTrack object represents a media source in the user agent. Several MediaStreamTrack objects can represent the same media source, e.g., when the user chooses the same camera in the UI shown by two consecutive calls to getUserMedia() . Note that a web application can revoke all given permissions with MediaStreamTrack.stop(). A MediaStreamTrack has three stages in its lifecycle. A track begins as new prior to being connected to an active source. Once connected, the started event fires and the track becomes live. In the live state, the track is active and media is available for rendering at a MediaStream consumer. A muted or disabled MediaStreamTrack renders either silence (audio), black frames (video), or a zero-information-content equivalent. The muted/unmuted state of a track reflects if the source provides any media at this moment. The enabled/disabled state is under application control and determines if the track outputs media (to its consumers). Hence, media from the source only flows when a MediaStreamTrack object is both unmuted and enabled. A MediaStreamTrack is muted when the source is temporarily unable to provide the track with data. A track can be muted by a user. Often this action is outside the control of the application. This could be as a result of the user hitting a hardware switch, or toggling a control in the operating system or browser chrome. A track can also be muted by the user agent. For example, a track that is a member of a MediaStream, received via a RTCPeerConnection [ WEBRTC10 ], is muted if the application on the other side disables the corresponding track in the MediaStream being sent. Applications are able to enable or disable a MediaStreamTrack to prevent it from rendering media from the source. A muted track will however, regardless of the enabled state, render silence and blackness. A disabled track is logically equivalent to a muted track, from a consumer point of view. A newly created MediaStreamTrack object is always enabled unless stated otherwise. A MediaStreamTrack object is said to end when the source of the track is disconnected or exhausted. If the track's readyState attribute has the value ended already, then abort these steps. Set track's readyState attribute to ended. If the end of the stream was reached due to a user request, the event source for this event is the user interaction event source. Constraints are independent of sources. However, if the sourceType is "none", the readonly attribute is true, or the remote attribute is true, the track's constraints will not be applied to the source. Whether MediaTrackConstraints were provided at track initialization time or need to be established later at runtime, the APIs defined below allow the retrieval and manipulation of the constraints currently established on a track. Each track maintains an internal version of the MediaTrackConstraints structure, namely a mandatory set of constraints (no duplicates), and an optional ordered list of individual constraint objects (may contain duplicates). The internal stored constraint structure is only exposed to the application using the existing MediaTrackConstraints, MediaTrackConstraintSet, MediaTrackConstraint, and similarly-derived-type dictionary objects. When track constraints change, a user agent must queue a task to evaluate those changes when the task queue is next serviced. Similarly, if the sourceType changes, then the user agent should perform the same actions to re-evaluate the constraints of each track affected by that source change. The MediaStreamTrack.enabled attribute, on getting, MUST return the last value to which it was set. On setting, it MUST be set to the new value, and then, if the MediaStreamTrack object is still associated with a track, MUST enable the track if the new value is true, and disable it otherwise. Thus, after a MediaStreamTrack is disassociated from its track, its enabled attribute still changes value when set; it just doesn't do anything with that new value. Unless a MediaStreamTrack object is created as a part a of special purpose algorithm that specifies how the track id must be initialized, the user agent MUST generate a globally unique identifier string and initialize the object's id attribute to that string. MediaStreamTrack.id attribute MUST return the value to which it was initialized when the object was created. The MediaStreamTrack.kind attribute MUST return the string "audio" if the object represents an audio track or "video" if object represents a video track. User agents MAY label audio and video sources (e.g., "Internal microphone" or "External USB Webcam"). The MediaStreamTrack.label attribute MUST return the label of the object's corresponding track, if any. If the corresponding track has or had no label, the attribute MUST instead return the empty string. Thus the kind and label attributes do not change value, even if the MediaStreamTrack object is disassociated from its corresponding track. The MediaStreamTrack.muted attribute MUST return true if the track is muted, and false otherwise. This event handler, of type ended, MUST be supported by all objects implementing the MediaStreamTrack interface. This event handler, of type mute, MUST be supported by all objects implementing the MediaStreamTrack interface. This event handler, of type overconstrained, MUST be supported by all objects implementing the MediaStreamTrack interface. This event handler, of type started, MUST be supported by all objects implementing the MediaStreamTrack interface. This event handler, of type unmute, MUST be supported by all objects implementing the MediaStreamTrack interface. If the track (audio or video) is backed by a read-only source such as a file, or the track source is a local microphone or camera, but is shared so that this track cannot modify any of the source's settings, the readonly attribute MUST return the value true. Otherwise, it must return the value false. The readyState attribute represents the state of the track. It MUST return the value to which the user agent last set it. If the track is sourced by an RTCPeerConnection, the remote attribute MUST return the value true. Otherwise, it must return the value false. This API will replace all existing constraints with the provided constraints (if existing constraints exist). Otherwise, it will apply the newly provided constraints to the track. constraints MediaTrackConstraints ✘ ✘ A new constraint structure to apply to this track. Returns a dictionary with all of the capabilities for the track type. If the track type is VideoStreamTrack, the AllVideoCapabilities dictionary is returned. If the track type is AudioStreamTrack, the AllAudioCapabilities dictionary is returned. Given that implementations of various hardware may not exactly map to the same range, an implementation should make a reasonable attempt to translate and scale the hardware's setting onto the mapping provided by this specification. If this is not possible due to the user agent's inability to retrieve a given capability from a source, then for CapabilityRange-typed capabilities, the min and max fields will not be present on the returned dictionary, and the supported field will be false. For CapabilityList-typed capabilities, a suitable "notavailable" value will be the sole capability in the list. An example of the user agent providing an alternative mapping: if a source supports a hypothetical fluxCapacitance state whose type is a CapabilityRange, and the state is defined in this specification to be the range from -10 (min) to 10 (max), but the source's (hardware setting) for fluxCapacitance only supports values of "off" "medium" and "full", then the user agent should map the range value of -10 to "off", 10 should map to "full", and 0 should map to "medium". Constraints imposing a strict value of 3 will cause the user agent to attempt to set the value of "medium" on the hardware, and return a fluxCapacitance state of 0, the closest supported setting. No error event is raised in this scenario. CapabilityList objects should order their enumerated values from minimum to maximum where it makes sense, or in the order defined by the enumerated type where applicable. See the AllVideoCapabilities and AllAudioCapabilities dictionaries for details on the expected types for the various supported state names. Let trackClone be a newly constructed MediaStreamTrack object. Initialize trackClone's id attribute to a newly generated value. Let trackClone inherit this track's underlying source, kind and label attributes. Returns the complete constraints object associated with the track. If no mandatory constraints have been defined, the mandatory field will not be present (it will be undefined). If no optional constraints have been defined, the optional field will not be present (it will be undefined). If neither optional, nor mandatory constraints have been created, the value null is returned. Returns authorized information for all available sources. Returns an object containing all the state variables associated with the allowed constraints. Let track be the current MediaStreamTrack object. End track. The track starts outputting only silence and/or blackness, as appropriate. Permanently stop the generation of data for track's source. If the data is being generated from a live source (e.g., a microphone or camera), then the user agent SHOULD remove any active "on-air" indicator for that source. If the data is being generated from a prerecorded source (e.g. a video file), any remaining content in the file is ignored. The task source for the tasks queued for the stop() method is the DOM manipulation task source. new The track type is new and has not been initialized (connected to a source of any kind). This state implies that the track's label will be the empty string. The track is active (the track's underlying media source is making a best-effort attempt to provide data in real time). The output of a track in the live state can be switched on and off with the enabled attribute. The track has ended (the track's underlying media source is no longer providing data, and will never provide more data for this track). Once a track enters this state, it never exits it. For example, a video track in a MediaStream ends if the user unplugs the USB web camera that acts as the track's media source. none This track has no source. This is the case when the track is in the "new" or "ended" readyState. camera A valid source type only for VideoStreamTracks. The source is a local video-producing camera source. microphone A valid source type only for AudioStreamTracks. The source is a local audio-producing microphone source. MUST be either "audio" or "video". If the application is authorized to get info from this source, the label attribute will be filled in with exactly the same value as would have been returned from a call to getUserMedia() with a constraint specifying this source's sourceId. The unique id for this source as described in the MediaSourceStates dictionary. user The source is facing toward the user (a self-view camera). environment The source is facing away from the user (viewing the environment). left The source is facing to the left of the user. right The source is facing to the right of the user. Displayed in an appropriate tag (e.g., a video or audio element). The video element MUST have a unique origin so that it is inaccessible to the content JS. This is the same security mechanism as is used with an ordinary audio or video element which has a src= property from a separate origin. Used as the argument to addStream() for a PeerConnection, subject to the restrictions detailed in the WebRTC document. When the noaccess=true constraint applies to a track, that track may be added to any PeerConnection. Open Issue: The editors worry that the above paragraph is just wrong. If the track can be added to a PeerConnection that is connect to another PeerConenction in the same application, the application could get access to the data. We sugest this should be changed from "may be added" to "may not be added". This will allow noaccess=true to be used for things like hair check dialogs. When the peerIdentity=foo constraint applies to a track, then that track may be added only to PeerConnections with compatible peer identities as described in the WebRTC document. Both the noaccess and peerIdentity constraints must be mandatory. Any use of them in the optional block must trigger an error. The addtrack and removetrack events use the MediaStreamTrackEvent interface. Firing a track event named e with a MediaStreamTrack track means that an event with the name e, which does not bubble (except where otherwise stated) and is not cancelable (except where otherwise stated), and which uses the MediaStreamTrackEvent interface with the track attribute set to track, MUST be created and dispatched at the given target. The track attribute represents the MediaStreamTrack object associated with the event. The MediaStreamTrack object cannot be instantiated directly. To create an instance of a MediaStreamTrack, one of its derived track types may be instantiated. These derived types are defined in this section. Note that the camera's green light doesn't come on when a new track is created; nor does the user get prompted to enable the camera/microphone. Those actions only happen after the developer has requested that a media stream containing "new" tracks be bound to a source via getUserMedia(). Until that point tracks are inert. Video tracks may be instantiated with optional media track constraints. These constraints can be later modified on the track as needed by the application, or created after-the-fact if the initial constraints are unknown to the application. Returns an array of application-unique source identifiers. This list will be populated only with local sources whose sourceType is "camera" and if allowed by the user-agent, "readonly" variants of the former two types. The video source ids returned in the list constitute those sources that the user agent can identify at the time the API is called (the list can grow/shrink over time as sources may be added or removed). As a static method, getSourceIds can be queried without instantiating any VideoStreamTrack objects or without calling getUserMedia(). Issue: This information deliberately adds to the fingerprinting surface of the UA. However, this information will not be identifiable outside the scope of this application and could also be obtained via other round-about techniques using getUserMedia(). See definition of getSourceIds on the VideoStreamTrack object. Note that the list of source ids for AudioStreamTrack will be populated only with local sources whose sourceType is "microphone" and if allowed by the user-agent, "readonly" microphone variants. Browsers provide a media pipeline from sources to sinks. In a browser, sinks are the <img>, <video> and <audio> tags. Traditional sources include camera, microphones, streamed content, files and web resources. The media produced by these sources typically does not change over time - these sources can be considered to be static. The sinks that display these sources to the user (the actual tags themselves) have a variety of controls for manipulating the source content. For example, an <img> tag scales down a huge source image of 1600x1200 pixels to fit in a rectangle defined with width="400" and height="300". The getUserMedia API adds dynamic sources such as microphones and cameras - the characteristics of these sources can change in response to application needs. These sources can be considered to be dynamic in nature. A <video> element that displays media from a dynamic source can either perform scaling or it can feed back information along the media pipeline and have the source produce content more suitable for display. The act of changing or applying a track constraint may affect the state of all tracks sharing that source and consequently all down-level sinks that are using that source. Many sinks may be able to take these changes in stride, such as the <video> element or RTCPeerConnection. Others like the Recorder API may fail as a result of a source state change. The RTCPeerConnection is an interesting object because it acts simultaneously as both a sink and a source for over-the-network streams. As a sink, it has source transformational capabilities (e.g., lowering bit-rates, scaling-up or down resolutions, adjusting frame-rates), and as a source it could have its own states changed by a track source (though in this specification sources with the remote attribute set to true do not consider the current constraints applied to a track). To illustrate how changes to a given source impact various sinks, consider the following example. This example only uses width and height, but the same principles apply to any of the states exposed in this proposal. In the first figure a home client has obtained a video source from its local video camera. The source's width and height state are 800 pixels by 600 pixels, respectively. Three MediaStream objects on the home client contain tracks that use this same sourceId. The three media streams are connected to three different sinks: a <video> element (A), another <video> element (B), and a peer connection (C). The peer connection is streaming the source video to an away client. On the away client there are two media streams with tracks that use the peer connection as a source. These two media streams are connected to two <video> element sinks (Y and Z). Note that at this moment, all of the sinks on the home client must apply a transformation to the original source's provided state dimensions. A is scaling the video up (resulting in loss of quality), B is scaling the video down, and C is also scaling the video up slightly for sending over the network. On the away client, sink Y is scaling the video way down, while sink Z is not applying any scaling. Using the constraint APIs, the home client's video source is changed to a higher resolution (1920 by 1200 pixels). Note that the source change immediately affects all of the sinks on the home client, but does not impact any of the sinks (or sources) on the away client. With the increase in the home client source video's dimensions, sink A no longer has to perform any scaling, while sink B must scale down even further than before. Sink C (the peer connection) must now scale down the video in order to keep the transmission constant to the away client. While not shown, an equally valid states change request could be made of the away client video source (the peer connection on the away client's side). This would not only impact sink Y and Z in the same manner as before, but would also cause re-negotiation with the peer connection on the home client in order to alter the transformation that it is applying to the home client's video source. Such a change would not change anything related to sink A or B or the home client's video source. 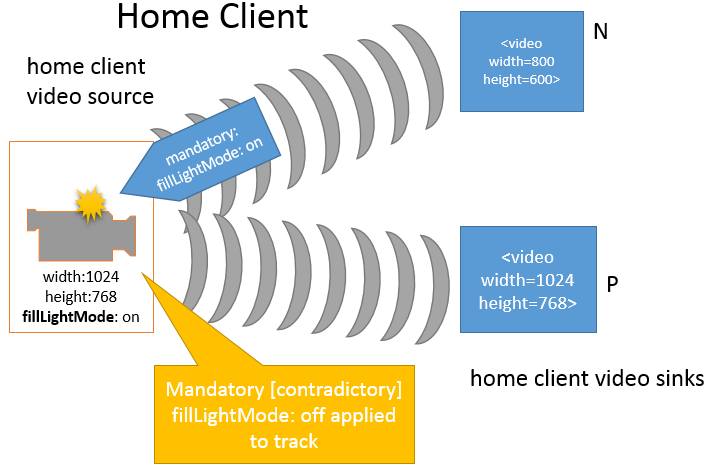 Note that this specification does not define a mechanism by which a change to the away client's video source could automatically trigger a change to the home client's video source. Implementations may choose to make such source-to-sink optimizations as long as they only do so within the constraints established by the application, as the next example demonstrates. It is fairly obvious that changes to a given source will impact sink consumers. However, in some situations changes to a given sink may also be cause for implementations to adjust the characteristics of a source's stream. This is illustrated in the following figures. 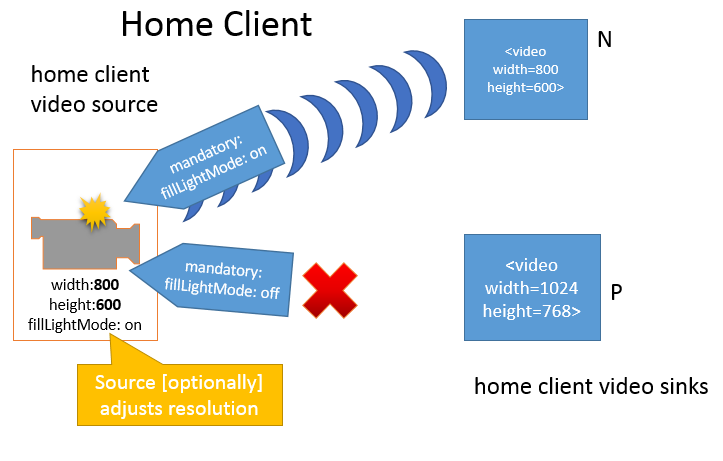 In the first figure below, the home client's video source is sending a video stream sized at 1920 by 1200 pixels. The video source is also unconstrained, such that the exact source dimensions are flexible as far as the application is concerned. Two MediaStream objects contain tracks with the same sourceId, and those MediaStreams are connected to two different <video> element sinks A and B. Sink A has been sized to width="1920" and height="1200" and is displaying the source's video content without any transformations. Sink B has been sized smaller and, as a result, is scaling the video down to fit its rectangle of 320 pixels across by 200 pixels down. In the above figure, the home client's video source resolution was changed to the greater of that from sinkA and from sinkB in order to optimize playback. While not shown above, the same behavior could apply to peer connections and other sinks. It is possible that constraints can be applied to a track which a source is unable to satisfy. When this happens, the user agent is required to fire an "overconstrained" event to the track informing it of this condition, and the track becomes muted. There is no mandatory side-effect on the source itself as a result of this condition. When multiple tracks share the same source (as illustrated in the previous figures), it is also possible that two (or more) tracks can apply contradictory constraints on the source. Since there is only a single thread of control, it is always possible for the browser to determine which track created the overconstrained condition. In this situation, the user agent MUST send the "overconstrained" event only to the track that created the condition and MUST not apply any of the constraints newly requested for that track. Here is an example of this behavior. In this example, two media streams each have a video track that share the same source. The first track has a mandatory constraint forcing on the source's fill light. That track is connected to sink N. Sink N has a width and height of 800 by 600 pixels and is scaling down the source's resolution of 1024 by 768 to fit. The other track initially has no constraints applied; it is connected to sink P. Sink P has a width and height equal to that of the source. Now, the second track adds a mandatory constraint that the fill light should be forced off. At this point, both mandatory constraints cannot be satisfied by the source (the fill light cannot be simultaneously on and off at the same time). The second track is transitioned into the muted state and receives an "overconstrained" event. At the same time, the source notes that its remaining active sink only requires a resolution of 800 by 600 and so it adjusts its resolution down to match (this is an optional optimization that the user agent is allowed to make given the situation). At this point, it is the responsibility of the application to fix the problem that led to the overconstrained situation (by either removing the fill light mandatory constraint on the second track, or by changing/removing the fill light mandatory constraint on the first track). There is a variable associated with each capability that represents the state of the source with respect to that capability, the actual setting in use by the source. In the same way that the current set of constraints can be returned on a track using the constraints() method, the states() method on a track returns the values of the state variables associated with all capabilities, as the MediaSourceStates object. Only states appropriate to the sourceType are returned. Note: The following specific list(s) of states DOES NOT REFLECT CONSENSUS. Many states beyond these have been proposed, and the ones listed do not have universal support. The ones below are included **** ONLY **** to provide a starting point so we can see concrete examples of what real states might look like. The particular set below was chosen to match the **also temporary** set of constraints. The current aspect ratio for the source. Aspect ratio is width in pixels divided by height in pixels, rounded to the tenth decimal place. Returned for video sources. From the user's perspective, this value describes whether this camera is pointed toward the user ("user") or away from the user ("environment"). Returned for video sources. The current frames per second rate of video provided by this source. If the source does not provide a frameRate (or the frameRate cannot be determined from the source stream), then this attribute MUST be the user agent's vsync display rate. Returned for video sources. The height (in pixels) of the source of the video flowing through the track. Returned for video sources. The application-unique identifier for this source. The same identifier must be valid between sessions of this application, but must also be different for other applications. Some sort of GUID is recommended for the identifier. Returned for all types of sources (video, audio, etc.). The type information associated with the currently attached source. Returned for all types of sources (video, audio, etc.). The current audio track's volume (as a percentage). A volume of 0 is silence, while a volume of 100 is the maximum supported volume. Returned for audio sources. The width (in pixels) of the source of the video flowing through the track. Returned for video sources. Each constraint that is supported by an implementation MUST have an associated capability that will be returned in the result of a call to the capabilities() method. Capabilities are provided as either a min/max range or a list of enumerated values. Min/max capabilities are always provided for constraints that are not enumerated types. Listed capabilities are always provided for constraints corresponding to enumerated types. The maximum value of this capability. The type of this value is specific to the capability. If the related capability is not supported by the source, then this field will not be provided by the user agent (it will be undefined). The minimum value of this capability. Returns the value true if the capability is supported, false otherwise. Throughout this specification, the identifier CapabilityList is used to refer to the sequence type. Capability Lists are just an array of supported DOMString values from the possible superset of values described by each state's enumerated type. Note: The following specific list(s) of capabilities DOES NOT REFLECT CONSENSUS. Many capabilities beyond these have been proposed, and the ones listed do not have universal support. The ones below are included **** ONLY **** to provide a starting point so we can see concrete examples of what real capabilities might look like. The particular sets below were chosen to match the **also temporary** set of constraints. The supported range of aspect ratio defined as a floating point number rounded to 10 decimal places on the source and representing the width in pixels divided by the height in pixels. The type of the min/max values are float. The available video facing options (VideoFacingModeEnum) on the source. The supported range of frame rates on the source. The type of the min/max values are float. The range should span the video source's pre-set height values with min being the smallest width, and max the largest width. The type of the min/max values are unsigned long. The available source identifiers of the current source -- this will always return a list with a single identifier (that of the current source). Note, to get a list of other available source identifiers, use the static getSourceIds() method. The available sourceType options (SourceTypeEnum) on the current source. The range should span the video source's pre-set width values with min being the smallest width, and max the largest width. The type of the min/max values are unsigned long. The supported range of output volume percentages on the source. The type of the min/max values are unsigned long. Mints a Blob URL to refer to the given MediaStream. For audio and video streams, the data exposed on that stream MUST be in a format supported by the user agent for use in audio and video elements. A Blob URL is the same as what the File API specification calls a Blob URI, except that anything in the definition of that feature that refers to File and Blob objects is hereby extended to also apply to MediaStream objects. A MediaStream may be assigned to media elements as defined in HTML5 [ HTML5 ] A MediaStream is not preloadable or seekable and represents a simple, potentially infinite, linear media timeline. The timeline starts at 0 and increments linearly in real time as long as the MediaStream is playing. The timeline does not increment when the MediaStream is paused. There are two methods by which a MediaStream may be assigned to a media element. First, createObjectURL can be used to obtain a URL for the MediaStream. That URL can then be used to set the src attribute of the media element itself, or of one of its <source> children. Secondly, UAs that support this specification MUST support the following partial interface, which allows a MediaStream to be assigned directly to a media element. Whenever the user agent runs the media element load algorithm, reaches the resource fetch phase of this algorithm, and determines that the media resource in question is a MediaStream, it MUST immediately abort the resource selection algorithm, setting the media.readyState to HAVE_ENOUGH_DATA. The UA MUST NOT buffer data from a MediaStream. When playing, the UA MUST always play the current data from the stream. If a MediaStream is inactive and the media element is ended, and the element's autoplay attribute is set to true, should it start playing automatically if new Tracks are added to the MediaStream? src DOMString a local URI referencing a MediaStream The markup author can use this attribute to specify the source of the media. createObjectURI can be used to generate a URI referring to a MediaStream which can be used as the value of this attribute. In such a case, revocation of the URI does not count as a change to this field and does not trigger the media element load algorithm. currentSrc DOMString a local URI referencing a MediaStream or the empty string The UA automatically sets the value of this attribute. When sourceObj is specified the UA MUST set it to the empty string. preload DOMString none A MediaStream cannot be preloaded. buffered TimeRanges buffered.length MUST return 1. A MediaStream cannot be preloaded. Therefore, the amount buffered is always an empty TimeRange. networkState unsigned short NETWORK_IDLE	 The media element does not fetch the MediaStream so there is no network traffic. currentTime double Any positive integer. The initial value is 0 and the values increments linearly in real time whenever the stream is playing. The value is the current stream position, in seconds. The UA MUST ignore attempts to set this attribute. duration unrestricted double Infinity A MediaStream does not have a pre-defined duration. seeking boolean false A MediaStream is not seekable. Therefore, this attribute MUST always have the value false. defaultPlaybackRate double 1.0 A MediaStream is not seekable. Therefore, this attribute MUST always have the value 1.0 and any attempt to alter it MUST fail. playbackRate double 1.0 A MediaStream is not seekable. Therefore, this attribute MUST always have the value 1.0 and any attempt to alter it MUST fail. played TimeRanges played.length MUST return 1.
played.end(0) MUST return the last known currentTime. A MediaStream's timeline always consists of a single range, starting at 0 and extending up to the currentTime. seekable TimeRanges seekable.length MUST return 0.
seekable.end() MUST return currentTime. A MediaStream is not seekable. startDate Date Not-a-Number (NaN) A MediaStream does not specify a timeline offset. loop boolean false A MediaStream has no defined end and therefore cannot be looped. ended Event The MediaStream finished as a result of all tracks in the MediaStream ending. addtrack MediaStreamTrackEvent A new MediaStreamTrack has been added to this stream. Note that this event is not fired when the script directly modifies the tracks of a MediaStream. removetrack MediaStreamTrackEvent A MediaStreamTrack has been removed from this stream. Note that this event is not fired when the script directly modifies the tracks of a MediaStream. started Event The MediaStreamTrack object has just transitioned from the "new" readyState to another state. This event fires before any other corresponding events such as "ended" or "statechanged". mute Event The MediaStreamTrack object's source is temporarily unable to provide data. unmute Event The MediaStreamTrack object's source is live again after having been temporarily unable to provide data. This event fires asynchronously for each affected track (when multiple tracks share the same source) after the user agent has evaluated the current constraints against a given sourceId and is not able to configure the source within the limitations established by the union of imposed constraints. Due to being over-constrained, the user agent must mute each affected track. The affected track(s) will remain un-usable (in the "muted" readyState) until the application adjusts the constraints to accommodate the source's capabilities. The "overconstrained" event is a simple event of type Event; it carries no information about which constraints caused the source to be over-constrained (the application has all the necessary APIs to figure it out). ended Event The MediaStreamTrack object's source will no longer provide any data, either because the user revoked the permissions, or because the source device has been ejected, or because the remote peer stopped sending data, or because the stop() method was invoked. Prompts the user for permission to use their Web cam or other video or audio input. The syntax for getUserMedia() is still under discussion. Some questions are: whether it creates media streams or just initializes ones already created; whether it creates streams synchronously (immediate return of MediaStream with callback later when user grants permission) or asynchronously (MediaStream available only upon callback). The constraints argument is an object of type MediaStreamConstraints. The successCallback will be invoked with a suitable MediaStream object as its argument if the user accepts valid tracks as described below. The errorCallback will be invoked if there is a failure in finding valid tracks or if the user denies permission, both as described below. Let constraints be the method's first argument. Let successCallback be the callback indicated by the method's second argument. Let errorCallback be the callback indicated by the method's third argument. Let requestedMediaTypes be the set of media types in constraints with either a dictionary value or a value of "true". Let finalSet be an (initially) empty set. If successCallback is null, abort these steps. Let candidateSet be all possible tracks of media type T that the browser could return. If the value of the T entry of constraints is "true", jump to the step labeled final below. Otherwise, continue. If the constraint is not supported by the browser, queue a task to invoke errorCallback with a new NavigatorUserMediaError object whose name attribute has the value CONSTRAINT_NOT_SATISFIED and whose constraintName atribute is set to the name of the constraint that caused the error and then jump to the step labeled failure below. Remove from the candidateSet any track that cannot satisfy the value given for the constraint. If the candidateSet no longer contains at least one track, queue a task to invoke errorCallback with a new NavigatorUserMediaError object whose name attribute has the value CONSTRAINT_NOT_SATISFIED and whose constraintName atribute is set to the name of the constraint that caused the error and then jump to the step labeled failure below. Otherwise, continue with the next mandatory constraint. Let the secondPassSet be the current contents of the candidateSet. If the constraint is not supported by the browser, skip it and continue with the next constraint. Remove from the secondPassSet any tracks that cannot satisfy the value given for the constraint. If the secondPassSet is now empty, let the secondPassSet be the current contents of the candidateSet. Otherwise, let the candidateSet be the current contents of the secondPassSet. Final: Add the tracks in the candidateSet to the finalSet. Return, and run the remaining steps asynchronously. Optionally, e.g., based on a previously-established user preference, for security reasons, or due to platform limitations, jump to the step labeled failure below. Prompt the user in a user agent specific manner for permission to provide the entry script's origin with a MediaStream object representing a media stream. The provided media MUST include precisely one track of each media type in requestedMediaTypes from the finalSet. The decision of which tracks to choose from the finalSet is completely up to the user agent and may be determined by asking the user. Unless and until a new set of constraints is provided, the user agent MAY change its choice of track at any point, provided that 1) the new choice does not violate given user permissions, and 2) it notifies the application code by raising an event. It may wish to do this, for example, if the user interface or network congestion changes. Note that no such change will have an effect on the presence or absence of each type of track, merely the contents. Define the event that should be raised when the user agent changes its choice of track. User agents are encouraged to default to using the user's primary or system default camera and/or microphone (when possible) to generate the media stream. User agents MAY allow users to use any media source, including pre-recorded media files. If the user grants permission to use local recording devices, user agents are encouraged to include a prominent indicator that the devices are "hot" (i.e. an "on-air" or "recording" indicator). If the user denies permission, jump to the step labeled failure below. If the user never responds, this algorithm stalls on this step. Let stream be the MediaStream object for which the user granted permission. Queue a task to invoke successCallback with stream as its argument. Let error be a new NavigatorUserMediaError object whose name attribute has the value PERMISSION_DENIED. Queue a task to invoke errorCallback with error as its argument. The task source for these tasks is the user interaction task source. All instances of the Navigator type are defined to also implement the NavigatorUserMedia interface. Provide definition of audio constraints here. Provide definition of video constraints here. Provide definition of optional constraints here. Provide definition of mandatory constraints here. A MediaTrackConstraintSet is a dictionary containing one or more key-value pairs, where each key MUST be a valid registered constraint name in the IANA-hosted RTCWeb Media Constraints registry [ RTCWEB-CONSTRAINTS ] and its value SHOULD be as defined in the associated reference(s) given in the registry. A MediaTrackConstraint is a dictionary containing exactly one key-value pair, where the key MUST be a valid registered constraint name in the IANA-hosted RTCWeb Media Constraints registry [ RTCWEB-CONSTRAINTS ] and the value SHOULD be as defined in the associated reference(s) given in the registry. The name of the constraint that caused the error. Only used for some types of errors. For NavigatorUserMediaError with a name of CONSTRAINT_NOT_SATISFIED , the constraintName attribute in the NavigatorUserMediaError object MUST be set to the name of the constraint that caused the error. A human readable description of the error. This string may vary between different user agents. A string representing the type of error. This string must be one of those defined by the NavigatorUserMediaErrorName enum for the error object to be valid. PERMISSION_DENIED User denied permission for scripts from this origin to access the media device. CONSTRAINT_NOT_SATISFIED One of the mandatory constraints could not be satisfied. The user agent is encouraged to reserve resources when it has determined that a given call to getUserMedia() will succeed. It is preferable to reserve the resource prior to invoking the success callback provided by the web page. Subsequent calls to getUserMedia() (in this page or any other) should treat the resource that was previously allocated, as well as resources held by other applications, as busy. Resources marked as busy should not be provided as sources to the current web page, unless specified by the user. Optionally, the user agent may choose to provide a stream sourced from a busy source but only to a page whose origin matches the owner of the original stream that is keeping the source busy. This document recommends that in the permission grant dialog or device selection interace (if one is present), the user be allowed to select any available hardware as a source for the stream requested by the page (provided the resource is able to fulfill mandatory constraints, if any were specified), in addition to the ability to substitute a video or audio source with local files and other media. A file picker may be used to provide this functionality to the user. This document also recommends that the user be shown all resources that are currently busy as a result of prior calls to getUserMedia() (in this page or any other page that is still alive) and be allowed to terminate that stream and utilize the resource for the current page instead. If possible in the current operating environment, it is also suggested that resources currently held by other applications be presented and treated in the same manner. If the user chooses this option, the track corresponding to the resource that was provided to the page whose stream was affected must be removed. Additionally, if removing a track in this manner causes the stream to contain no more tracks, the onended event must be raised on it. A MediaStream may contain more than one video and audio track. This makes it possible to include video from two or more webcams in a single stream object, for example. However, the current API does not allow a page to express a need for multiple video streams from independent sources. It is recommended for multiple calls to getUserMedia() from the same page be allowed as a way for pages to request multiple, discrete, video or audio streams. A single call to getUserMedia() will always return a stream with either zero or one audio tracks, and either zero or one video tracks. If a script calls getUserMedia() multiple times before reaching a stable state, this document advises the UI designer that the permission dialogs should be merged, so that the user can give permission for the use of multiple cameras and/or media sources in one dialog interaction. The constraints on each getUserMedia call can be used to decide which stream gets which media sources. This sample code exposes a button. When clicked, the button is disabled and the user is prompted to offer a stream. The user can cause the button to be re-enabled by providing a stream (e.g., giving the page access to the local camera) and then disabling the stream (e.g., revoking that access). This example allows people to take photos of themselves from the local video camera. Note that the forthcoming Image Capture specification may provide a simpler way to accomplish this. Note: The following specific list(s) of constraints DOES NOT REFLECT CONSENSUS. Many constraints beyond these have been proposed, and the ones listed do not have universal support. The ones below are included **** ONLY **** to provide a starting point so we can see concrete examples of what real constraints might look like. Along those lines, there was an attempt to include constraints of a variety of types so sample type definitions could be included as well (e.g., DOMString, MinMaxConstraint). sourceType SourceTypeEnum Constrain the video or audio source to an exact value from the set of enumerated-type values of the SourceTypeEnum. sourceId DOMString Constrain the video or audio source to an exact source identifier value. noaccess boolean Prevent the stream from being applied to an element which is readable by the JS. peerIdentity DOMString Prevent the stream from being applied to an element which is readable by the JS. Require that any PeerConnections to which the stream is added match the provided identity. width unsigned long or MinMaxConstraint Constrain the video source to the exact desired width or width range. height unsigned long or MinMaxConstraint Constrain the video source to the exact desired height or height range. frameRate float or MinMaxConstraint Constrain the video source to the exact desired frame rate (fps) or frameRate range. aspectRatio float or MinMaxConstraint Constrain the video source to the exact desired aspect ratio represented as floating point number rounded to 10 decimal places, representing the width in pixels divided by the height in pixels. facingMode VideoFacingModeEnum Constrain the video source to an exact value from the set of enumerated-type values of the VideoFacingModeEnum. volume unsigned long or MinMaxConstraint Constrain the audio source to the exact desired volume or volume range. For constraints that accept ranges, the MinMaxConstraint dictionary is also defined. Note that the type of the value associated with min and max must be the same for both. The specific types associated with min and max are defined differently for each constraint name. The related constraint's maximum allowed value. The related constraint's minimum allowed value. This section will be removed before publication. Bug 22252: fixed usage of MUST in MediaStream() constructor description. Bug 22215: made MediaStream.ended readonly. Bug 21967: clarified MediaStreamTrack.enabled state initial value. Added aspectRatio constraint, capability, and state. Updated usage of MediaStreams in media elements. Added explanatory section for constraints, capabilities, and states. Added VideoFacingModeEnum (including left and right options). Added getSourceInfos() and SourceInfo dictionary. Removed remaining photo APIs and references (since we have a separate Image Capture Spec). Removed getConstraint(), setConstraint(), appendConstraint(), and prependConstraint(). Added source states. Added states() method on tracks. Moved sourceType and sourceId to be states. Added source capabilities. Added capabilities() method on tracks. Added clarifying text about MediaStreamTrack lifecycle and mediaflow. Removed takePhoto() and friends from VideoStreamTrack (we have a separate Image Capture Spec). Made getUserMedia() error callback mandatory. Changed error code to be string instead of number. Added core of settings proposal allowing for constraint changes after stream/track creation. Introduced new representation of tracks in a stream (removed MediaStreamTrackList). Updated MediaStreamTrack.readyState to use an enum type (instad of unsigned short constants). Renamed MediaStream.label to MediaStream.id (the definition needs some more work). Limited the track kind values to "audio" and "video" only (could previously be user defined as well). Rename title to "Media Capture and Streams". Update document to comply with HTML5. Update image describing a MediaStream. Add known issues and various other editorial changes. Update wording for constraints algorithm. Added "Media Streams as Media Elements section". Added non-normative section "Implementation Suggestions". Add definitions of MediaStreams and related objects. Changed to make wanted media opt in (rather than opt out). Minor edits. Changed examples to use MediaStreamOptions objects rather than strings. Minor edits. Removed MediaStream stuff. Refers to webrtc 1.0 spec for that part instead. Created first version by copying the webrtc spec and ripping out stuff. Put it on github.